Arrived in London Monday Morning at about 11am, Not a bad trip up and I think someone at Railtrack reads my reviews…. remember I mentioned that I would have liked more room well they took me literally I almost had the whole carriage to myself! Got from the Station to the Hotel in record time and without having to queue for a Taxi. It was at this point I thought that maybe I was on one train going to London while everyone there was on another going to Wales part of a big practical joke :o) But I was wrong. After being told I may not be able to check in as it was too early, and then being allowed to, it was straight out and about. As this trip was about as truncated as any I’ve organised I wasn’t too sure what the running order would be it was all down to timing, Now I’m a Catholic but that doesn’t make us experts you know. Sustenance seeked and obtained it was to entertainment and the Cinema. 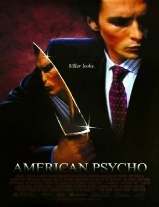 Well no one has taken my tip yet and organised a Monday Matinee so I checked out the various “Screens” available around Leicester Square and settled on AMERICAN PSYCHO. Well the hype on this film made it a must see….now we all know what hype can do …. yes thats right….make this twit part with hard earned cash [okay you lot in Risca but they don’t know that I don’t do any work ;o)] . Well what can I say probab.. no possibly worth seeing once, if there is nothing better to do, and the reason for this harsh review, well again probably the same reason for the same review for THE BLAIR WITCH PROJECT. I like a film that at least hints at, if not provides an explanation of why you’ve sat there for the last hour and a half. All this said the central performance by Christian Bale was very good, he really showed a range in one scene holding, barely, his temper because someone had a better business card than him and in one of the next…. well let’s just say I’ll never argue with a Huey Lewis fan again. Let you into a little secret here I did have part of the trip organised in that I already had tickets for the 2 shows I was to see in the evenings, well with them being NOTRE DAME DE PARIS and THE GRADUATE I didn’t want to chance it to luck getting tickets on the day. So really it was just the rest of the day I had to organise. As the times didn’t add up it was back to the hotel for a brief respite from the hustle and to prepare for the evening. Iron a shirt change watch a bit of telly … very little telly actually as it was terrible for a Bank holiday, and the venture out again, at this point I should say that every time I’ve mentioned going to or from the hotel I’ve taken a different route, not outside but INSIDE the building I mean come on I saw Alice twice selling route plans to the permanently bewildered. My room was inside the hotel this time so I had high hopes for a better night’s sleep but … well more of that later. 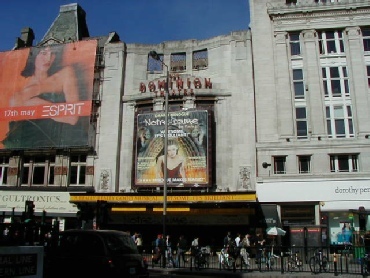 I took the scenic route to the Dominion…..okay so you regular readers know that means I got lost but I thought it was down Oxford Street to the Dominion not the same way ish as to Covent Garden then turn at the Palace Theatre. Well I got there had a quiet drink in a decorated Broom cupboard opposite and went in. NOTRE DAME DE PARIS – Well first impressions … The outside Illustration is very impressive….Inside…The ushers have grown…. no their standing on boxes…. very nice Programme and Brochure really capture the atmosphere of the show…. the Orchestra in the foyer is a nice touch even if it was only done to appease the unions… the inside of the auditorium…. no major changes from GREASE which was the last thing I saw there. I Take my seat, okay okay order an interval drink first THEN to my seat [you lot are getting to know me too well by half you know :o)] then I’m told to move as I didn’t check out how many aisles there were, and knowing I was on the end seat of row N I perched in this nice lady’s seat. She was very understanding I was very embarrassed and skulked off to the next aisle. I looked around to see James Coburn and party being lead to their seats. The show itself: Well I must admit I was somewhat doubtful what with all the complaints about the sound and the alternate / understudy situation. But, i was in for a treat. Brief Synopsis: “ESMERALDA” Hazel Fernandes is part of a group of refugees led by “CLOPIN” Luck Mervil when she dances she is seen by “PHOEBUS” Steve Balsamo, “FROLLO” Daniel Lavoie and “QUASIMODO” Ian Pirie, all of whom fall instantly in love with her, and here in lies the problems “FROLLO” is a Priest, “PHOEBUS” is to marry “FLEUR-DE-LYS” Natasha St-Pierre, and “QUASIMODO” is a deformed Hunchback. Here I should point out that the performers names listed above are the cast I saw on Monday the 29th May this year. Mind you to find out these names I had to ring the Theatre who gave me the number of the stage door who gave me the number of the Production Company. As, has been mentioned on the FORUM for this page there is no way of knowing who you saw at the Theatre no signs, planned performances or announcements. I don’t think people need much more of a synopsis than is above, suffice to say it’s a love story. To the Performances and the show itself, well I saw the alternate ESMERELDA & QUASIMODO but pretty much all the other principal players, and I must say I wasn’t disappointed. As I posted to the Forum I wasn’t over impressed by Tina Arenas’ performance on the “Tonight at the Palladium” show. But to be fair before saying she isn’t any good I’d need to see her in the show. And to answer a post on the Board her weight does have nothing to do with it, what I said was [personal preference, based on very limited experience] I thought that Hazel Fernandes was the prettiest, and as you need to believe that all these men could instantly fall for this “vision” that would make it easier for me. Although I must say her, Tina Arena’s picture in the programme could make me seriously start hedging my bets :o) “Age of the Cathedrals”, ” Torn Apart”, “Belle is the only word”, ” The Birds they put in cages”, “I’m a Priest” and ” Dance my Esmerelda” stood out for me as songs. With ” Age of the Cathedrals” being my favourite having heard the original French and now the English versions I think it is one of the best songs in a musical of any of the shows I’ve seen. The staging of this show is spectacular; words can’t do it justice it has to be seen. Stand out sections for me include: “The Age of Cathedrals” – I’ve never seen a better use for a climbing wall, the performers on it instil me with awe, as I get a nose bleed in high heels, and no I don’t wear them…… that often :o). And ” Dance my Esmerelda” – Which I could not have imagined staged better, and when you think your imagination isn’t bound by practicalities like “How much will it cost?” and ” is it possible? ?” That is the best compliment I can give it. Altogether an excellent show. Don’t listen to the critics, go and see it yourself and then make up your mind. I was undecided after hearing all the contrasting views but I can honestly say it was worth the trip on its own and I will be back….. If the critics don’t manage to close it first. Day two an early start, I don’t know why but I seem to have an in built alarm when I’m in London I can’t oversleep. I ventured out, went for a stroll, I know those that know me can’t possibly believe I would be so energetic but this city brings out the best in me :o), and was promptly propositioned by a Lady in Soho. I mean at 10am puurlease!! This seems to be a “regular” occurrence to solo male pedestrians in this area. I made my excuses and walked on…. I decided on two films and a show on what was my second and last day of this trip, walked diagonally across Leicester Square 3 or 4 times looking like an idiot while trying to arrange the timings for the films I wanted to see. Got to the Empire Cinema booked a seat for the late afternoon show of GALAXY QUEST went back to the other cinema for a ticket for SCREAM 3 and found it shut so back again to the Empire and I must say here they were very helpful exchanging my ticket for an earlier show. I considered a visit to the STAR WARS exhibition at the Barbican but at £10.00 I thought it a little steep, now if it were STAR TREK then I would have paid it like a shot, hint there for future exhibition organisers. GALAXY QUEST starring Tim Allen and Sigourney Weaver is a very good way to spend an afternoon, fun on two levels, the effects are good enough for it to work as a SCI-FI film and the in-jokes hit the target enough to take the Mick out of the genre as a whole, it’s performers and fans in particular, and as I class myself as one of the latter please don’t say I’m being unfair. The evening was reserved for a quiet date with an older lady. God I’m glad they put this show on now … leave it much longer and I couldn’t have used that line :o) the Lady in question was Mrs. Robinson and the evening was THE GRADUATE. This play is running at the Gielgud Theatre and stars Kathleen Turner and Matthew Rhys [a countryman of mine…. who said we’re taking over ;] It tells the story of the relationships between a young college graduate “BENJAMIN BRADDOCK” Rhys and his fathers best friends wife “MRS. ROBINSON” Turner. This show is famous among the general public for two reasons: It’s the latest in a line starring Hollywood stars and in this one the Hollywood star is stark naked in one scene. I must say I went into this show not knowing a great deal about the story, but will say in my defence I stated my interest in seeing it before the news broke about Ms. Turners couture problems :o). All knew was that there was a film, I’ve never seen it though I want to now] I only knew of the scene with the big plate glass window in the church and the Simon and Garfunkle song. But I must say I thoroughly enjoyed it. To relate specific scenes in a comedy is not fair as this is the definitive time when the phrase “you had to be there” is called for, So all I’ll say is go and see it and watch out for…. almost every scene with Kathleen Turner, the ones with the Psychiatrist, the one with the stripper, and all scenes where “Ms. Robinson” features. A thoroughly enjoyable evenings’ entertainment, only marginally spoilt by what must be THE most uncomfortable seats in the West End and two ladies sitting next to me who didn’t move when the interval arrived causing this 6 foot lunatic to reach an angle of 45 degrees to the floor trying to dodge their feet, bags, coats and other items before righting himself seconds before hitting the opposite wall ! A very novel way of asking for the bane of Theatre goers everywhere’s lives, to be switched off, the announcement reminding us that the action is set in the early `60’s ” Thirty years before the invention of the mobile telephone! Didn’t work on this night mind you as some twit left his or hers on and it went off almost immediately the curtain went up. Also little bit of gossip here for you…………… Rob has a celebrity stalker! No I’m not famous he is, well how else do you explain that James Coburn was at the Gielgud on Tuesday, I ask you???? :o) Seemed to be enjoying himself, and I didn’t have the nerve to ask for an autograph. So with the blues setting in as quickly as the curtain came down I ventured back towards the hotel and the now essential bar. Well I hate this time, knowing another trip is over and its oh….. about….. 86 days and 2 and a half hours before I’m back there again. This bad evening was added to by the pure and undiluted personification of the caring sharing community…. This particular example staying in the next room to me caring enough to share his entire music collection with the rest of us at full volume for about 4 and a half hours until about 3am! And may I take this opportunity to thank the person staying in the room the other side of him / her for joining in on THE WALL at 3am seconds before I did!! Well another trip over another review written, and I’m back in Wales with work facing me tomorrow, All I can say is be understanding when you hear that a civil servant has implanted a “please wait here sign” where the sun don’t shine on a jobseeker tomorrow and I can assure you that this mood passes quickly and I can tell you exactly when….. it’ll be about 85 and a half days from now. 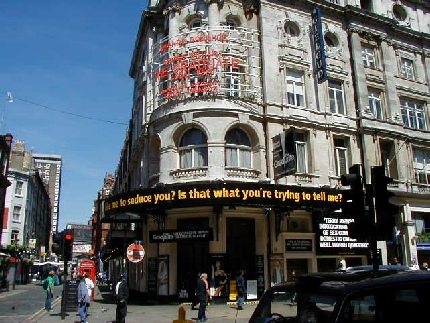 My name is Rob and I’m a Theatre Addict…… anybody wishing to join in the therapy sessions for the withdrawal symptoms caused by this insidious condition please feel free to e-mail me, as to quote a famous Londoner…. It helps to talk!